Product Description: A Wetpour system is a porous, durable, polymeric surface specifically developed for use on children’s playgrounds to give maximum safety and play value. Harnessing the latest technology, Wetpour rubber consists of synthetic EPDM rubber granulate bound in polyurethane resin to form a continuous, seamless surface. The strong, continuous structure of Wetpour Rubber gives it a very long life expectancy and discourages vandalism. The surface also resists abrasive wear and indentation. 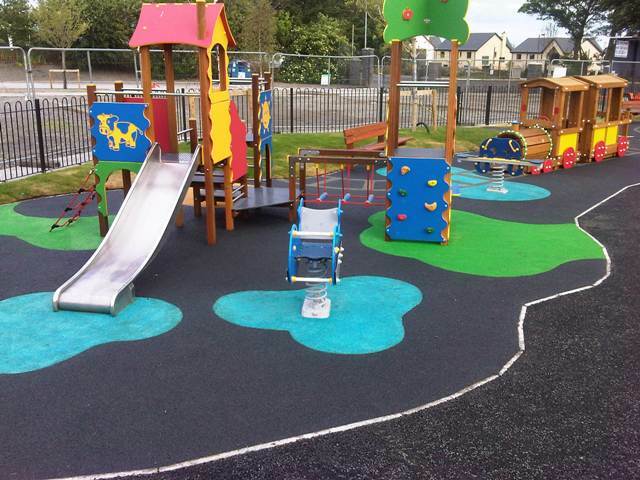 Wetpour rubber provides a practical safe surface on children’s playgrounds.